Your curated, one-stop shop for facial development and research. 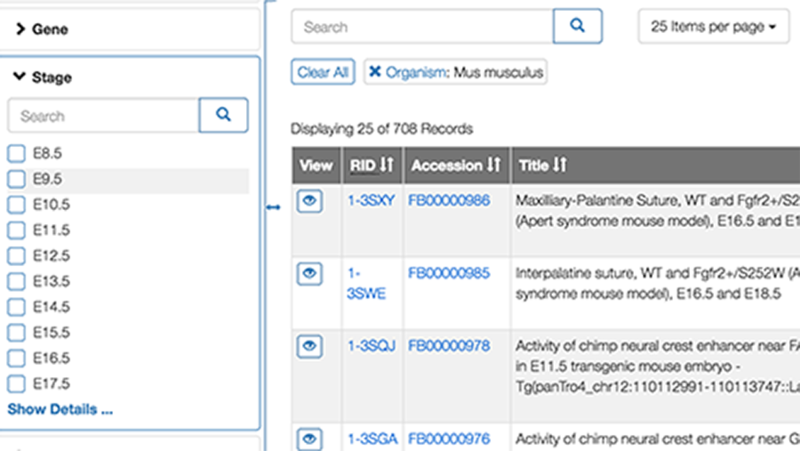 Search over 800 datasets by organisms, experiment type, age stage, mutation, genotype and more. See at a glance all experiment types for our mouse data by anatomy and age stage. For a full list, see our Resources Hub. 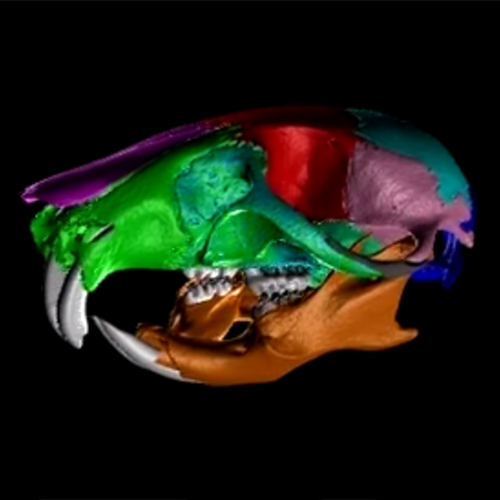 View a video that visualizes the entire dimensions of a mouse skull. By the Integrated research of functional genomics and craniofacial morphogenesis project (Chai). This dataset includes 3D white light photogrammetry images of North American children from Denver and San Francisco. By the Genetic Determinants of Orofacial Shape and Relationship to Cleft Lip/Palate project (Hallgrimsson/Klein/Spritz). This is restricted-access human data. To gain access to this data, you must first go through the process outlined here. Browse zebrafish imaged successively from 14-36 dpf by confocal microscopy, during the period of induction and growth of the frontal and parietal bones. By the Anatomical atlas and transgenic toolkit for late skull formation in zebrafish project (Fisher/Harris). Publications Spotlight View all FaceBase publications here. Systems biology of facial development: contributions of ectoderm and mesenchyme. Hooper, J. E., W. Feng, H. Li, S. M. Leach, T. Phang, C. Siska, K. L. Jones, R. A. Spritz, L. E. Hunter, T. Williams.. Dev. Biol 2017 Jun 1;426(1):97-114. doi: 10.1016/j.ydbio.2017.03.025. Epub 2017 Mar 29. Shaffer JR, Orlova E, Lee MK, Leslie EJ, Raffensperger ZD, Heike CL, Weinberg S, et al. PLoS Genet. 2016 Aug 25;12(8):e1006149. doi: 10.1371/journal.pgen.1006149. eCollection 2016. Fine tuning of craniofacial morphology by distant-acting enhancers. Attanasio C, Nord AS, Zhu Y, Blow MJ, Li Z, Liberton DK, Morrison H, Plajzer-Frick I, Holt A, Hosseini R, Phouanenavong S, Akiyama JA, Shoukry M, Afzal V, Rubin EM, FitzPatrick DR, Ren B, Hallgrímsson B, Pennacchio LA, Visel A. Science. 2013 Oct 25;342(6157):1241006. doi: 10.1126/science.1241006. Integration of comprehensive 3D microCT and signaling analysis reveals differential regulatory mechanisms of craniofacial bone development. Ho TV, Iwata J, Ho HA, Grimes WC, Park S, Sanchez-Lara PA, Chai Y. Dev Biol. 2015 Apr 15;400(2):180-90. doi: 10.1016/j.ydbio.2015.02.010. Epub 2015 Feb 23. Prescott SL, Srinivasan R, Marchetto MC, Grishina I, Narvaiza I, Selleri L, Gage FH, Swigut T, Wysocka J. Cell. 2015 Sep 24;163(1):68-83. doi: 10.1016/j.cell.2015.08.036. Epub 2015 Sep 10. Potter AS, Potter SS. PLoS One. 2015 Jul 13;10(7):e0132662. doi: 10.1371/journal.pone.0132662. eCollection 2015.